Portland Oregon for 8 days in 2 different RV Parks! 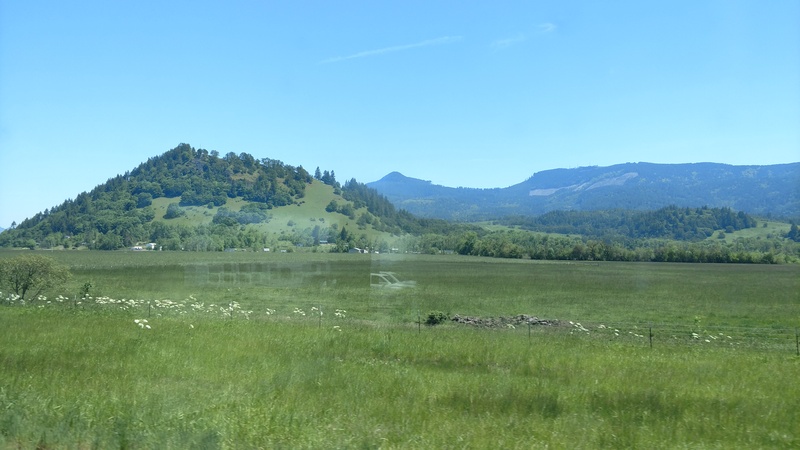 First of all I want to share some pictures in regards to the beautiful drive between Ashland and Portland Oregon. We had amazing weather with scattered clouds and no rain so we really got to enjoy the green and lush surroundings. 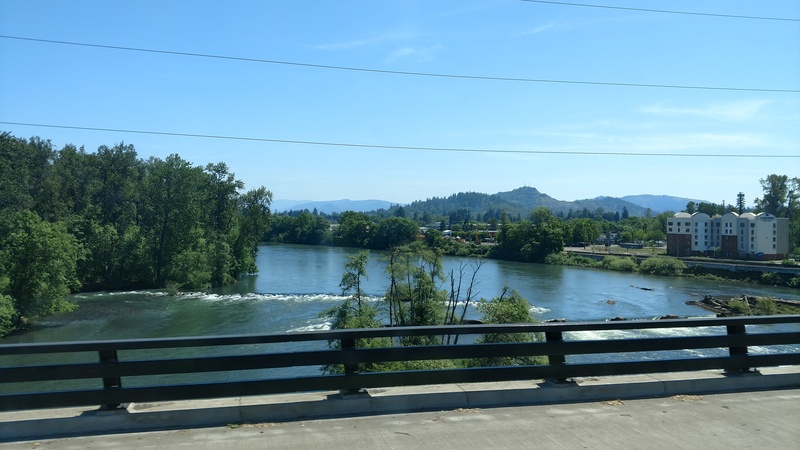 We passed over several Rivers including Umpqua River the Willamette River three times in Eugene Wilsonville and Portland and then the Columbia River. The drive took about 5 hours total but we did not rush at all! 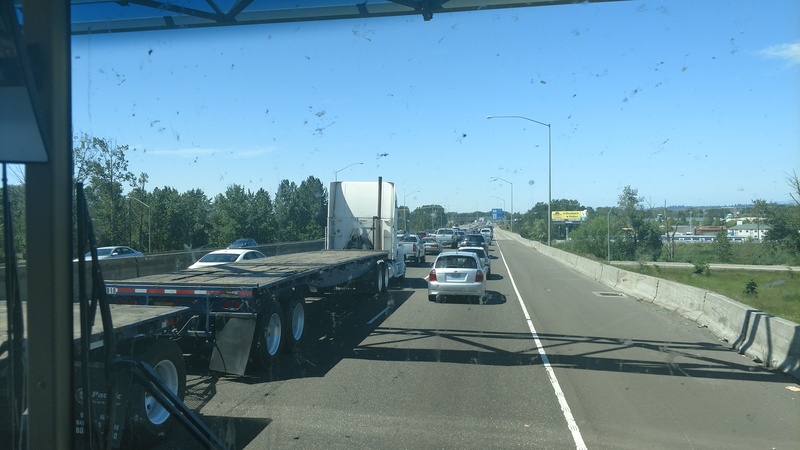 Once we got into Portland with our 40 foot RV and attached tocar we remembered something that we had long forgotten… The traffic was really really bad! Everywhere, pretty much all the time. I guess it’s worth it when you live in a city this pretty. 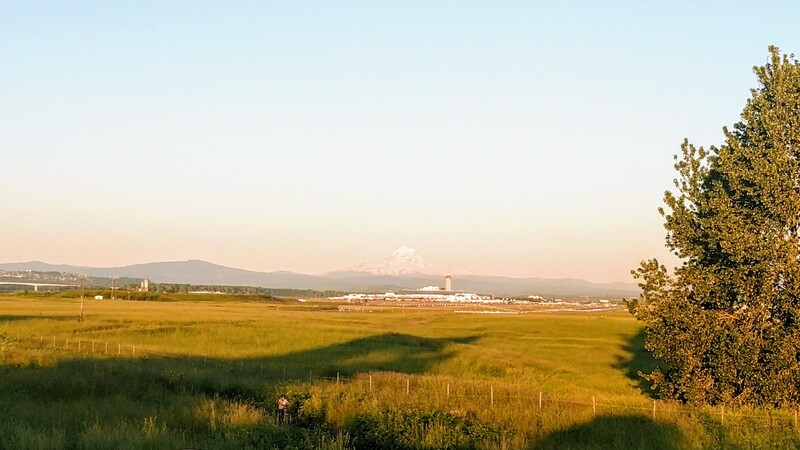 It is amazing how Mount Hood stands out as such a powerful symbol and backdrop to the entire landscape. 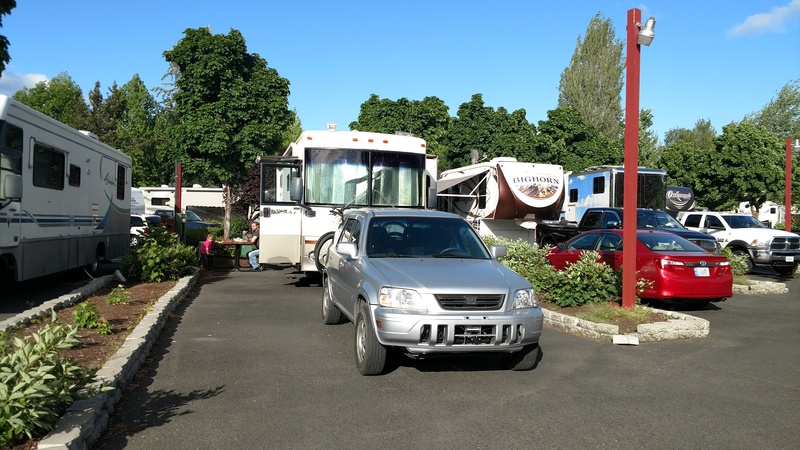 Anyhow our first RV park was Jantzen Beach RV Park located in North Portland. 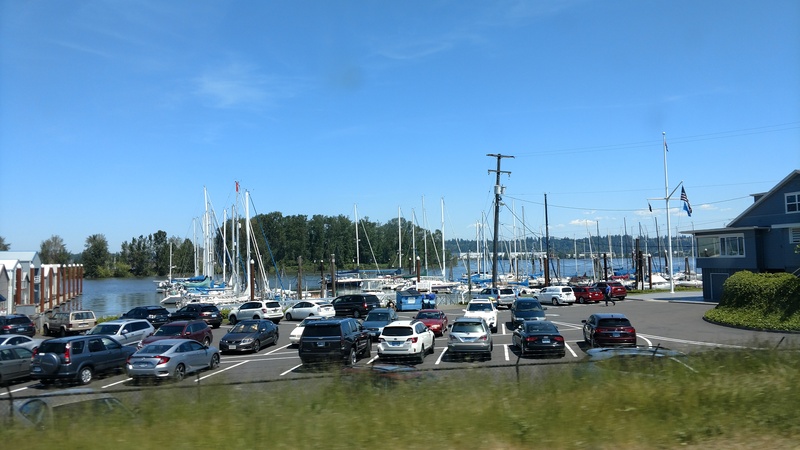 This RV park is literally on an island called Hayden Island which you can only access from one exit off of I-5. This becomes challenging because during rush hour there’s no quick way to get back on the eye without sitting in traffic. However the good thing is once you’re on the island there’s not much traffic there and there are definitely some shopping centers and restaurants and bars to go to. I will do another blog later as far as where I would recommend to go and what we did with our time in Portland. 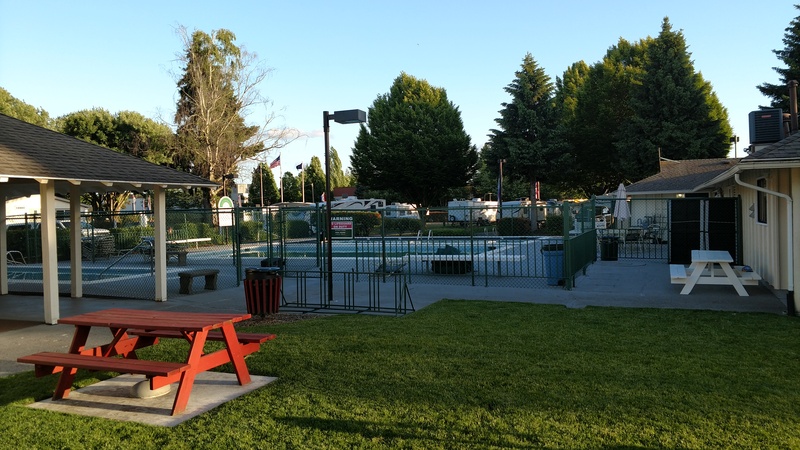 Jantzen Beach RV park itself felt very safe however it was quite a drastic change from the spacious spots we had an Ashland as these spots had no grass although we did get a picnic table. The entire park was booked solid so we had lots of Neighbors. Our least favorite part of this park was the noise level. It was loud… not from our neighbors at all!! …but from the airport, the trains passing by, and the constant air horns from the ships going to Port. It was very loud. Probably a little too loud. Anyway we did get a pull through spot with full hookups there are some spots there that have grass but we did not get one of those. 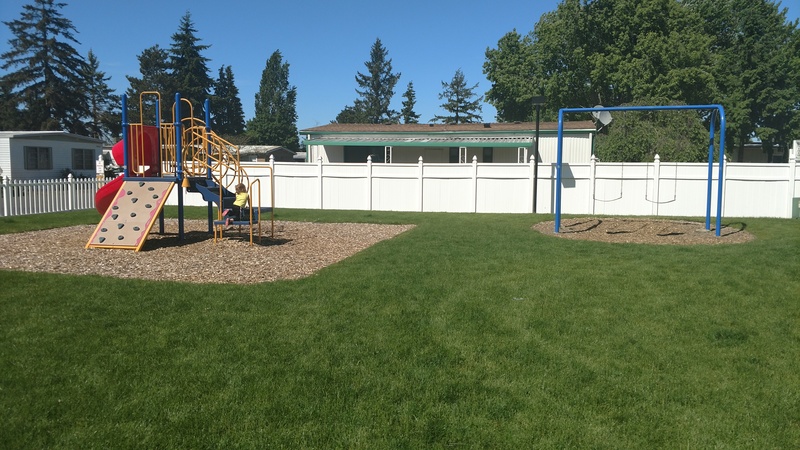 They do have a fantastic playground area for our toddler and swings and a patch of grass to play in. They also have three swimming pools and one of them is a kids pool. The pools were just opening up on Memorial Day weekend while we were there and when we finally stepped our toes in the water was ice cold so we did not do much swimming. 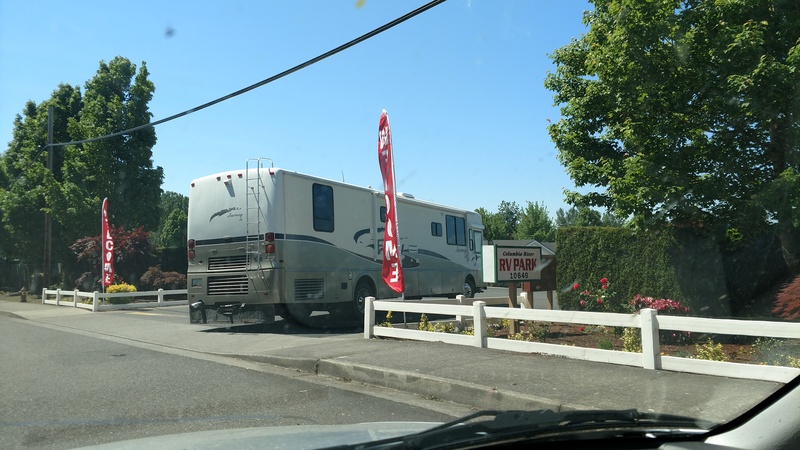 We had to move to another RV Park after a couple days because Jantzen Beach was booked solid and could not extend her stay which was fine due to the noise level. 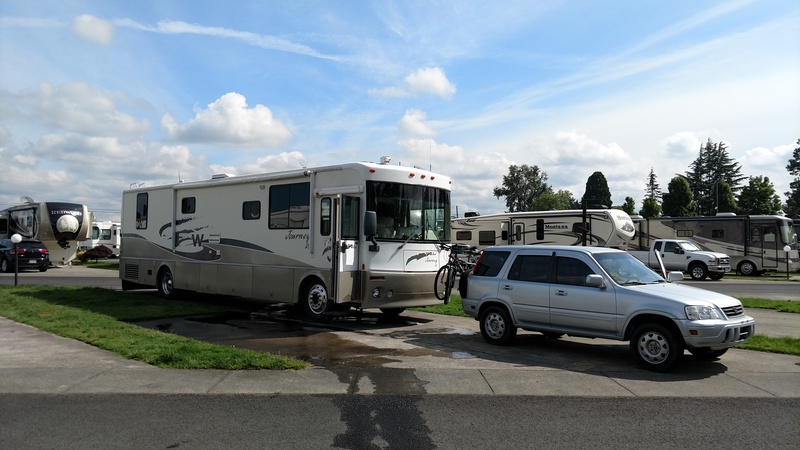 So we packed up all our stuff from spot 963 and went 2 miles east, closer to the airport to Columbia River RV Park. The location we found to be much more convenient as you do not have to access I-5 to get here. 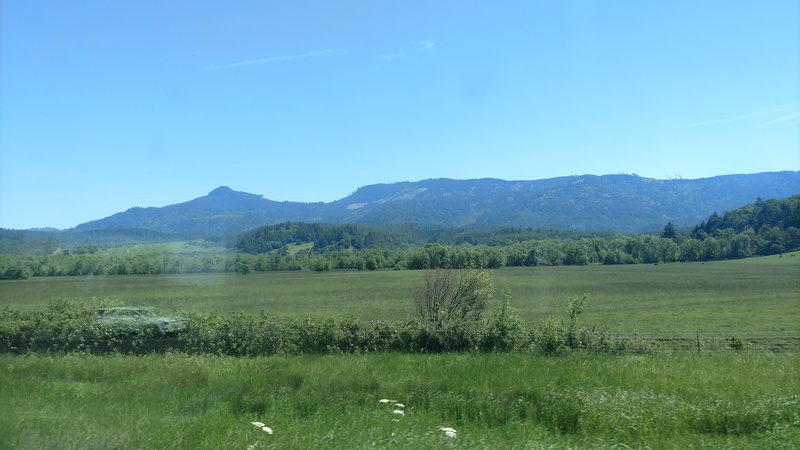 It is also a stone’s throw from the Columbia river which makes for a gorgeous drive when you’re heading home. This spot surprisingly was much quieter even though we were closer to the airport we did not hear the air horns from the ships or the train at all. 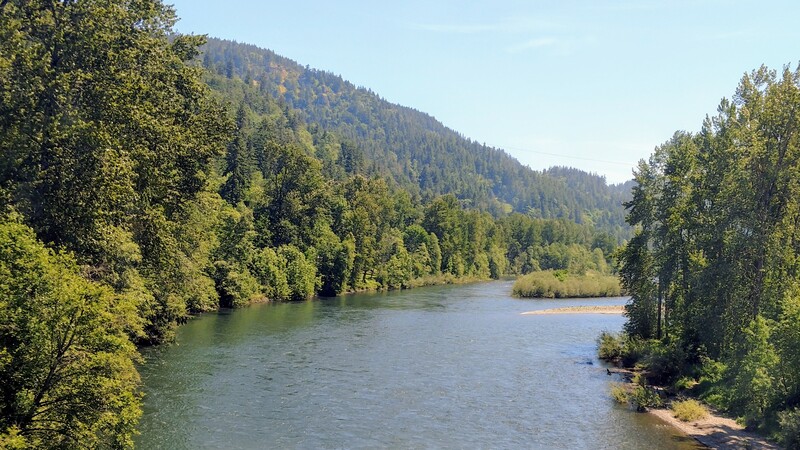 It is also very close and easy access to Vancouver Washington and both I-5 and 205. 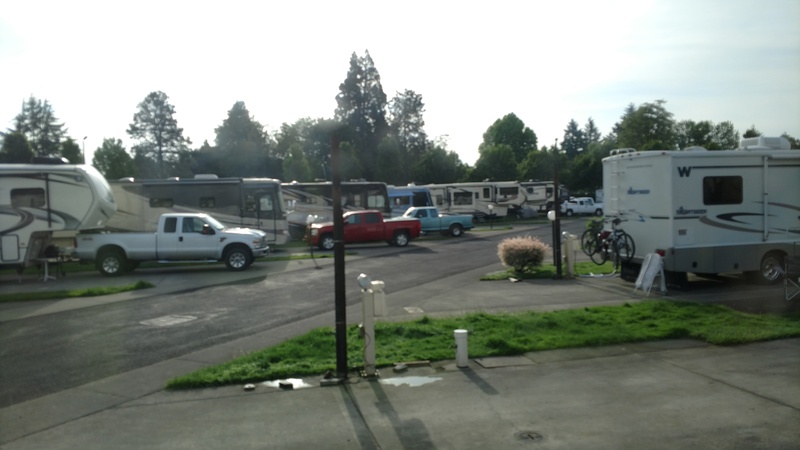 This RV park was very easy to access with a nice layout. This park however did not have any sort of accommodations for kids, no playground, no swimming pools or anything like that. I did not use the facilities but they did have a bath house. This place was completely at capacity as well and could not extend our stay more than the couple days we had reserved it. 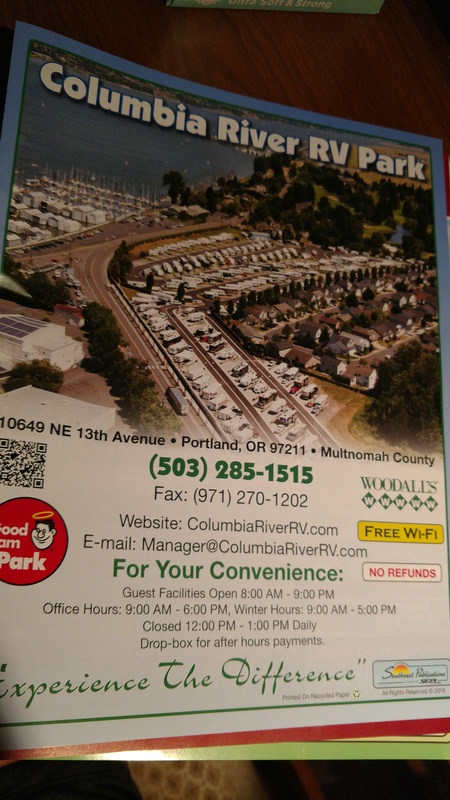 I would definitely recommend this place over Jantzen Beach RV Park…and you can’t beat the price at $35 per night!!! 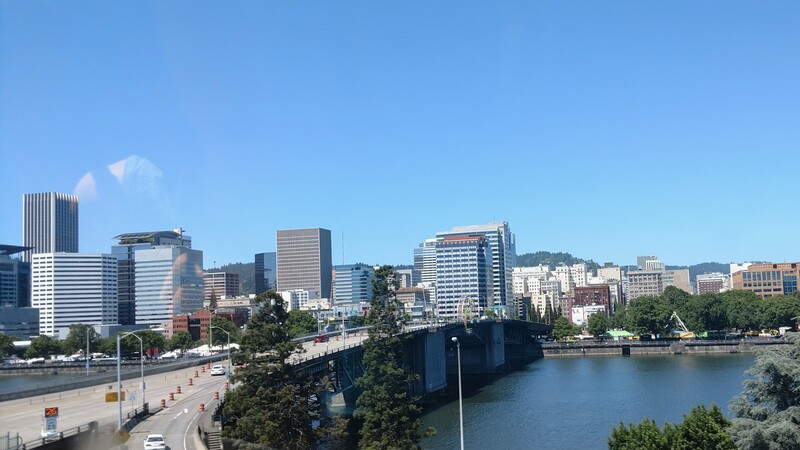 We really enjoyed our stay in Portland and feel fortunate because we had so much sunny weather. Now off to new adventures in Hood River as we make our way towards Canada! !